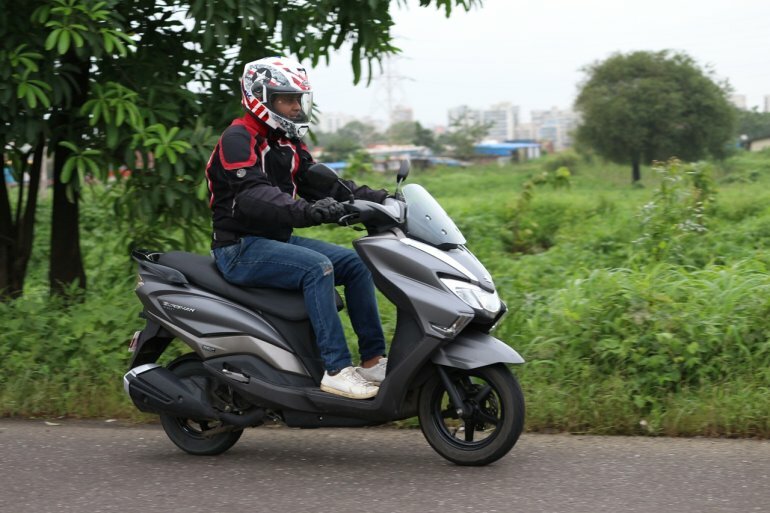 The Indian scooter market, which accounted for about 7 million units in 2017, is diversifying and has seen the introduction of premium sporty mode;s like the Aprilia SR150 & SR125, TVS Ntorq 125 and more to follow from Hero & TVS. Well, then it wasn’t a surprise that Suzuki jumped on the premium scooter bandwagon with its newest offerings - the Suzuki Burgman Street maxi-scooter. The Indian scooter market is dominated by the Honda Activa, with almost 2.5 lakh unit sales per month. The 110cc Activa is the Maruti Alto of the two-wheeler segment. That said, Honda has not been able to replicate that success in the 125 cc segment, which is reigned by the Suzuki Access 125. The Suzuki Burgman Street promises equal levels of practicality and added premium features over the Access. But is it worth the money? Let’s find out. 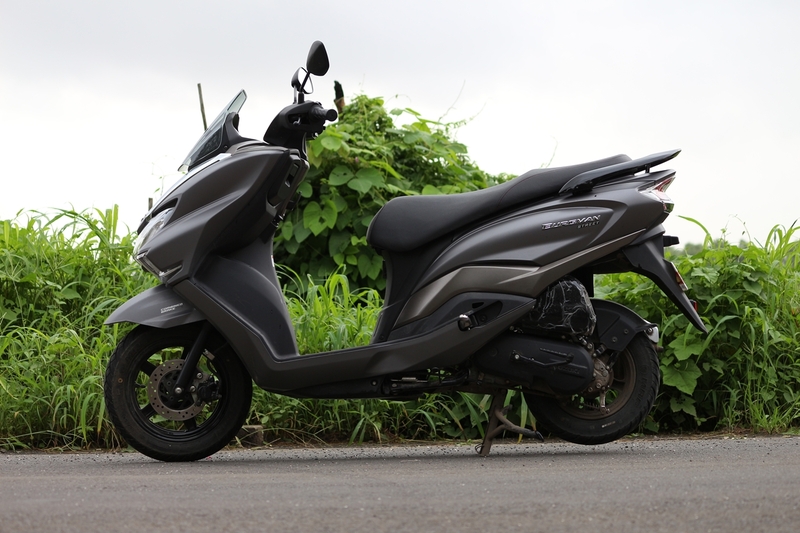 The hype around the Suzuki Burgman Street is its maxi-scooter styling. Adding to the practicality of the scooter is the flexi foot-forward seating position, which not only is unique but adds to the comfort as well. The bulbous proportions, sharp cuts and creases and sporty design give it a tremendous road presence. During my time with the maxi-scooter, the Burgman Street received repeated eyeballs for its design and dimensions. People would easily be misled into believing that it is a high displacement two-wheeler. Coming to the cosmetics, the sizeable front apron houses the arc LED headlights with daytime running lights and turn indicators, while there are twin chrome strips and a short visor mounted onto it. The Burgman Street sports a raised handlebar, while it’s the first Suzuki scooter to feature an all-digital instrument console, which is borrowed from the Suzuki Gixxer. It gets a roomy and comfortable step-up seat with complementing side panels. The Suzuki Burgman Street features LED taillights and a stubby exhaust. That said, the overall bulbous design is dwarfed by the tiny alloy wheels and tyre sizes. 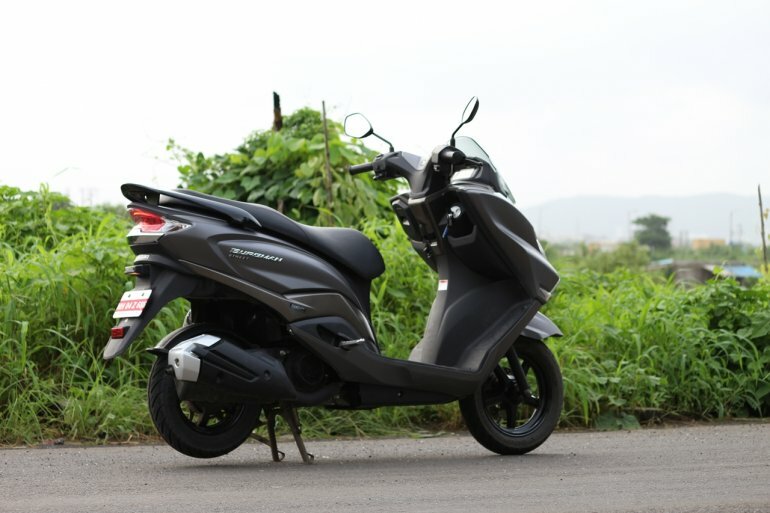 The Burgman Street comes shod with 12-inch front and 10-inch rear alloy wheels that wrap on 90-section front and 100-section rear tubeless tyres. Not only are the tyres smaller in sizes, but also makes the overall design disproportionate. 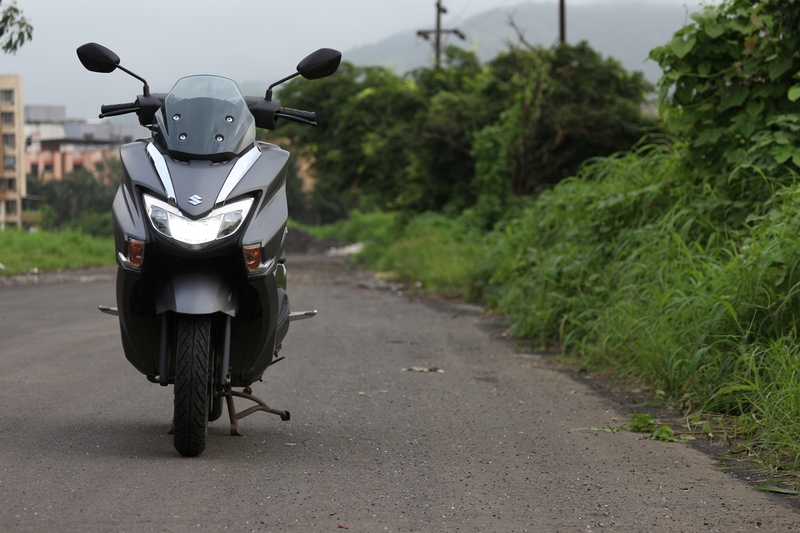 In comparison, the Aprilia SR125 features 14-inch wheels and 120-section tyres. The simple answer is YES! 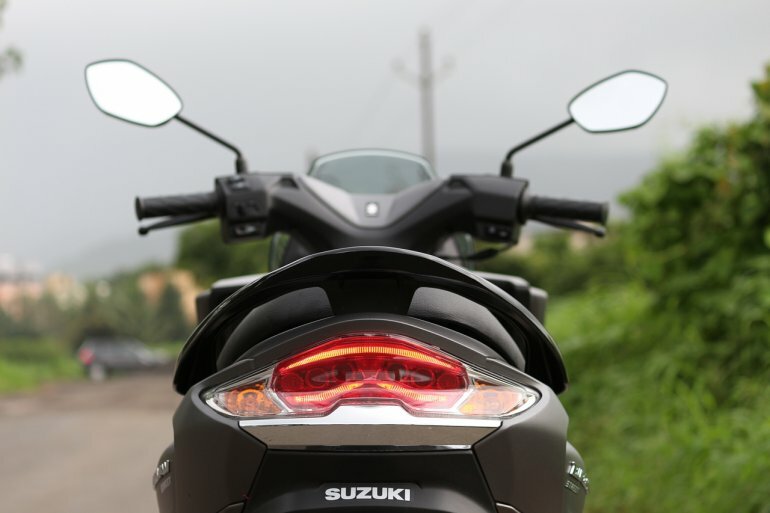 The Suzuki Burgman Street comes loaded with features to its gills. 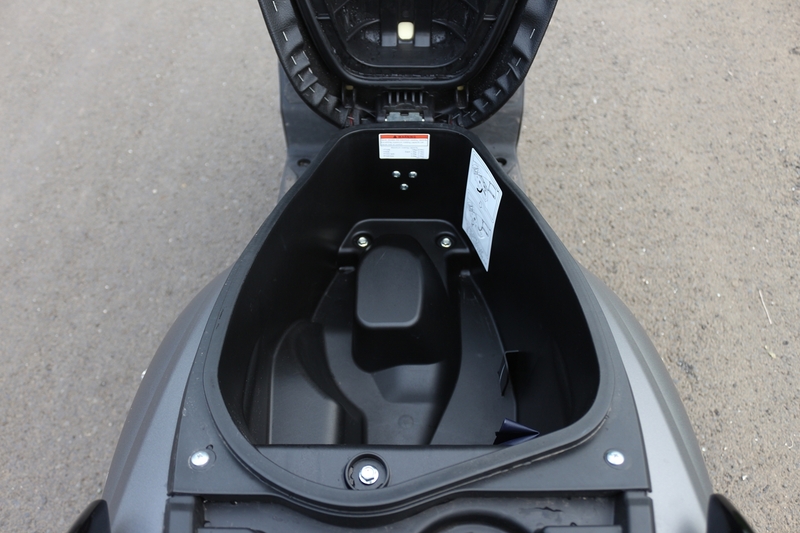 The scooter is equipped with multi-function digital speedometer, best-in-segment 21.5 litres boot space, a 12V DC charging socket with a glove box, and a storage rack. 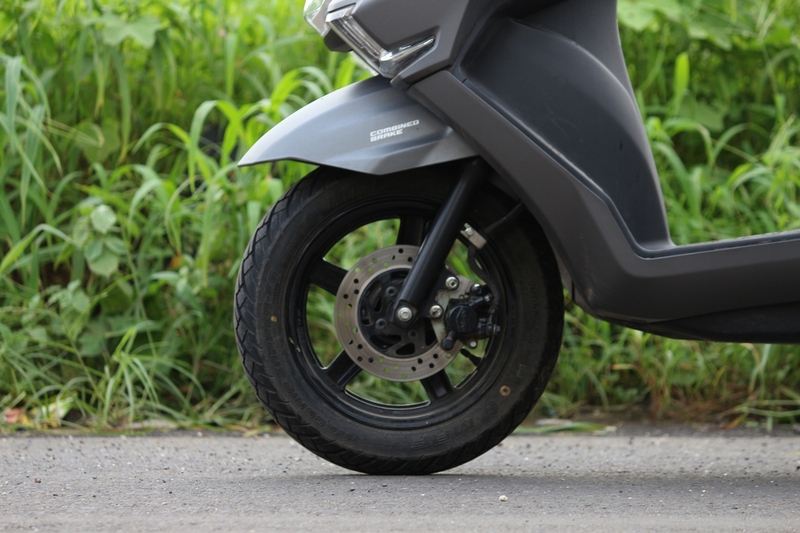 The Burgman Street also gets plush-fitting aluminium pillion foot pegs. The LED headlamps offer the superior throw and illumination and are probably the best lights in its segment. The Burgman Street also gets features like a USB charger, sidestep, and chrome mirrors as optional accessories. That said, the maxi-scooter doesn’t get a boot-light even as an option, which is very helpful after dusk. Swing a leg over the Suzuki Burgman Street, and you immediately feel it is a different scooter altogether. It takes some time getting used to, initially, but once you are familiar with it, there is no issue navigating through traffic. 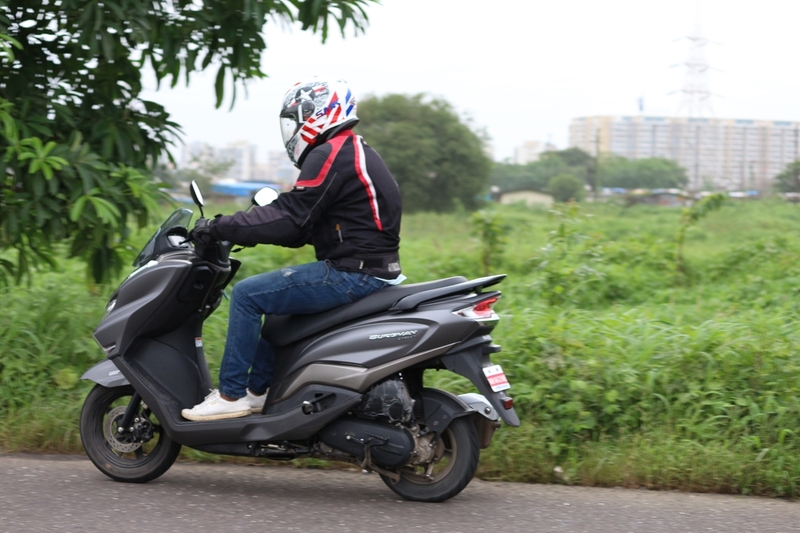 The maxi-scooter receives a wide handlebar, tall windshield and a large footboard with the ‘flexi foot-forward’ position, which enhances the riding comfort and practicality by a few notches. The Burgman Street receives upright ergonomics, and the spacious and well-padded seat offers immense comfort, something that is validated by my better half. That said, the aluminium pillion footrests, although plush-fitting, are narrow and slightly unaccommodating. The suspension setup is slightly on the softer side. 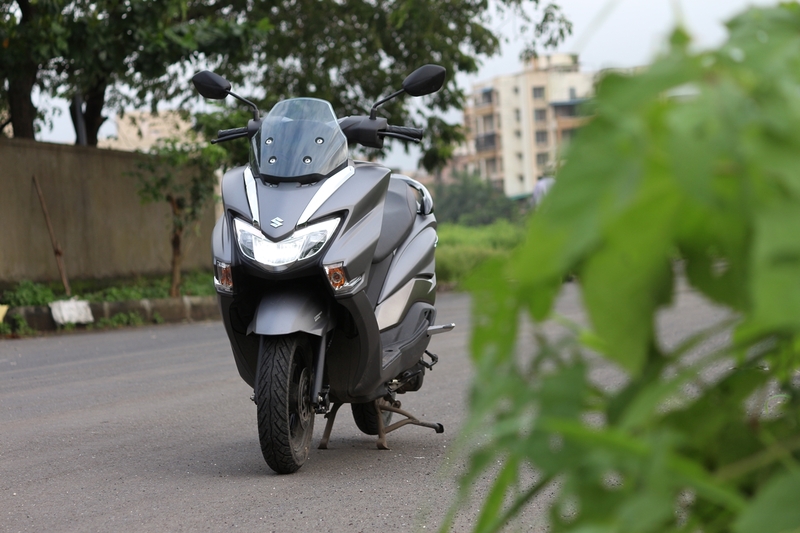 The scooter offers a compliant ride quality and the way in which it absorbs potholes and road undulations, its plain amazing! That said, the softer suspension setup doesn’t allow for spirited riding. The Suzuki Burgman Street shares its engine with the Access 125, and to our surprise, the motor felt more responsive despite the increased kerb weight of 6 kg. The 124 cc, single-cylinder mill features the Suzuki Easy Start system and produces 8.5 bhp of maximum power and 10.2 Nm of peak torque, mated to a CVT unit. The engine provides linear power delivery throughout the rev range, and the low-end and mid-range power delivery is perfect. There’s a delightful engine note; however, the motor sounds crotchety in high revs. The refinement levels are decent, but we would expect better NVH levels in future versions. The braking performance on the Burgman Street is sufficient. Anchorage comes from a 220 mm front disc and a rear drum brake with a combined braking system (CBS). The front disc lacks initial bite; however, it offers excellent feel and progression. Surprisingly, the rear drum unit provides better sting than the front disc brake. The Suzuki Burgman Street maxi-scooter is a unique product in the Indian two-wheeler market. There’s no doubt about it being a well-rounded offering from Suzuki Motorcycles India. However, the question is, who should buy it? If you are looking out for a premium scooter with a lot of comfort, features and practicality, then the Suzuki Burgman Street is for you. The only chink in its armour is the smaller wheel and narrow tyres. 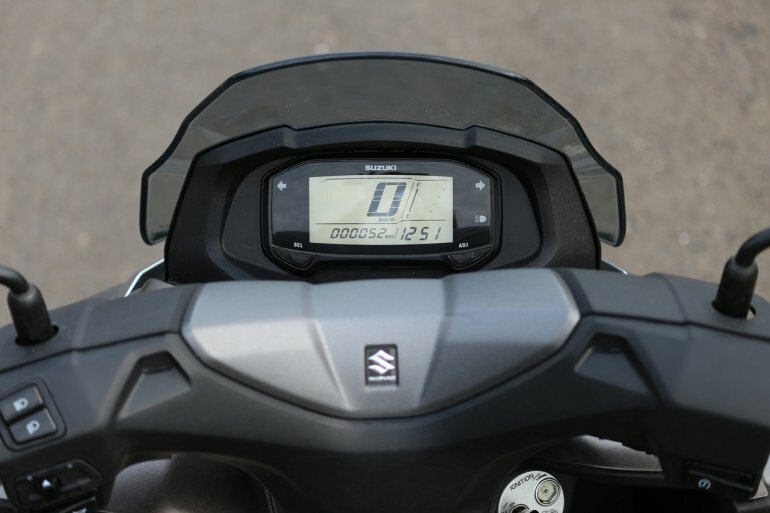 Sure, it does not offer smartphone connectivity like the TVS Ntorq 125 and outright performance like the Aprilia SR125. 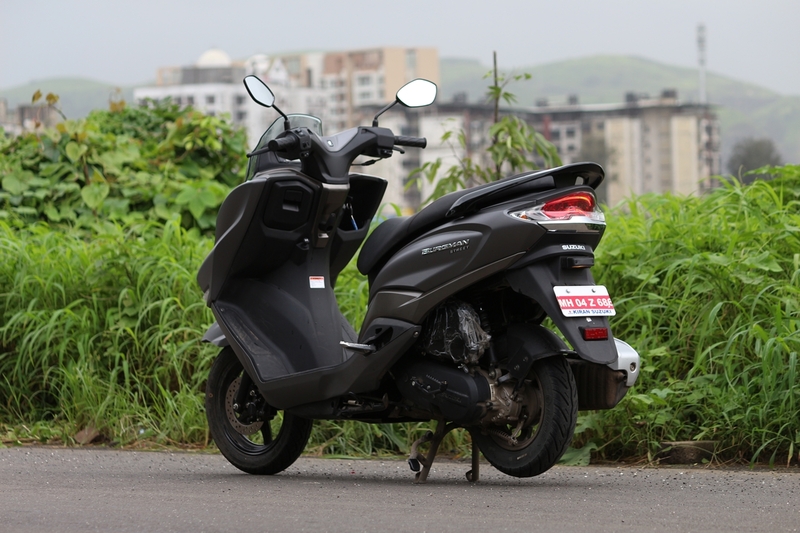 At INR 68,000 (ex-showroom Delhi), it is INR 8,000 costlier that the Ntorq 125 and INR 4,000 pricier than the Honda Grazia. That said, if you are looking out for a sporty and powerful scooter, look elsewhere.